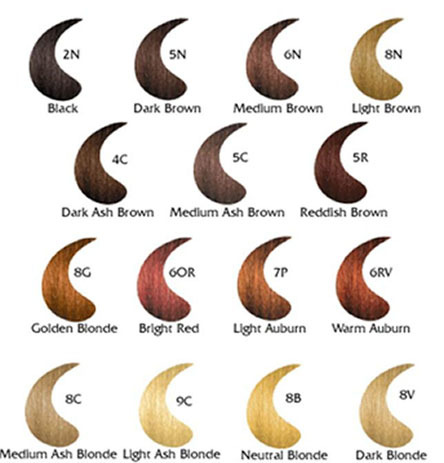 Here is the chart for EcoColors Hair Colors and some tips on how to get your desired color. BLACK is the darkest brown. Mix with Dark Ash Brown to discourage red tones. DARK BROWN will be a medium brown on gray hair. If you have existing dark brown hair, this shade may encourage red undertones. To tone down red undertones, use Dark Ash Brown or Medium Ash Brown. MEDIUM BROWN will be a light brown on gray hair. If you apply this to brown hair, you may get underlying red tones in the existing natural brown hair. LIGHT BROWN will be a golden blonde or light brown on gray hair. DARK ASH BROWN is used to counter unwanted red tones in existing dark brown hair. You do not need the ash series if you have 85% or more gray tones. MEDIUM ASH BROWN is a neutral medium brown. This color is used when you have existing natural brown and you would like to avoid underlying red tones. This shade is slightly darker than medium brown. Cool, medium ash brown enhances the clarity of a pale complexion. REDDISH BROWN application will result in an auburn shade. Mix with Golden Blonde to make the color brighter. GOLDEN BLONDE is golden blonde on gray hair. Mix with equal parts neutral blonde to make the tone a more neutral golden blonde. Mix Golden Blonde with Medium Brown to make a golden brown. BRIGHT RED is an orange red. It may not look natural on gray hair. To get the brightest most vivid red, mix equal parts Bright Red and Golden Blonde. Mix with Medium Brown or Dark Brown for natural brown with red tones. To achieve beautiful mahogany red, mix three parts Bright Red with one part Black. LIGHT AUBURN should never be used alone on gray or blonde hair. Always mix equal parts Light Auburn with Golden Blonde on gray or blonde hair. WARM AUBURN is a red with slight cool tones. If you have more than 50% gray, you may want to mix Warm Auburn with some Dark Brown or Medium Brown. for a more natural tone. For a beautiful auburn color, mix Warm Auburn with Golden Blonde. MEDIUM ASH BLONDE is a cool violet based blonde. It is often mixed with Light Brown to counter any warm undertones in the hair. LIGHT ASH BLONDE is the lightest shade in the home kit line. Mix with a small amount of Light Brown to obtain very light tone on gray hair. Light Ash Blonde alone on gray hair is not recommended. This color tone will only lighten your hair 1-2 shades and will not make a dark brown hair color blonde. NEUTRAL BLONDE is a true beige or wheat colored blonde. Mix Neutral Blonde with Golden Blonde to make a more natural blonde tone. You could also try two parts Neutral Blonde with one part Light Brown for a natural looking blonde tone on gray hair. DARK BLONDE. Application will result in a dark blonde shade on gray hair. Use dark blonde if you want to counter slight red tones. Dark Blonde may be used alone on gray hair. The best non toxic hair color alternative. 100% natural preservatives No additives No paraben No ppd No sulfite No ethanolamines or derivatives No propylene glycol No animal testing. 1 kit 4 oz.